So for all my Android users out there and all the lovers of Android launchers, I just want to say this article is for you. The Best Android Launchers For 2019 on your smartphone is literally the best thing ever. Every Android device ever produced comes with its very own Launcher, now that launcher is totally compatible with the phone obviously, which makes things easy for the user, but sometimes, some of us just get tired of always seeing that particular launcher and the interface and we might just need something new. There are a lot of amazing launchers on google play store and on every other Android app store out there. Now, I have compiled a list of what we consider to be the Best Android Launchers For 2019 so that you can give your smartphone a smart new amazingly outstanding new look. So get ready as I introduce my 10 Best Android Launchers For 2019. When you talk about Best Android launchers for 2019, you better mention Smart launcher among the launcher you might consider to be the best, because that is what I have done right now. The smart launcher is no just a launcher, but the easiest, smartest and coolest way to use your smartphone. With Smart launcher as your default launcher on your Android device, your Android device is indeed a smartphone. The smart launcher is just 8.1MB in the installation size, with over 10 million downloads and rated 4.4 stars on google play store, this app is simply amazing. The smart launcher has a lot of amazing features that makes your phone easy to use and just in case your big on privacy and don’t want certain people accessing your smartphone without your permission, you can customize your smart screen and whoever picks up your smartphone will be totally perplexed. Just click the donwload link now and start this smart journey now! Now, we are down to the second best Android launchers for 2019, Evie! Now smart launcher is amazing, makes your smartphone look a whole lot smarter, but Evie, hahaha, let’s just say Evie a whole new exciting launcher, I wouldn’t want to compare Smart launcher with Evie, so I’ll just say Evie is amazing. Evie has a way of bringing your phone to life, arranging your apps in a way that makes it easy for you to see them and access them. Shortcuts in Evie launcher are indeed shortcuts, takes you exactly where you need to be, you can use the Evie search bar, customize the search engine and choose the search engine you want, basically, It’ll be Google, the most popularly and widely used search engine. You can also lock your icons on your home screen, make it hard for someone to just get a hold of your phone and start accessing your personal files and information. Customization on Evie launcher is almost limitless. Download now for just approximately 10MB in the installation size, with over 5 million downloads. Now, most of you Android users must have heard of this launcher, one of the most popular launchers on the google play store, with amazing themes that can totally beautify your home screen and the whole phone’s interface. Install Go launcher with a few cool themes if you wish to try out this launcher. There are over 10 thousand themes that are ready and willing for you to install and use. One of the amazing thing about this launcher is the 3d icons, the amazing 3d effect that this launcher gives to the icons makes your Android device unique and beautiful. There are amazing features in Go Launcher, that has made it a household name for a long time, and these features get upgraded every time Go launcher has a new update. This app is just 51MB in the installation size with over a 100 million downloads, that’s mind blowing right? that’s why this app is on the list of one of the Best Android Launchers For 2019. The Amazing APUS Launcher, I personally have heard of this launcher and I decided to try it out for myself one day and I was totally amazed when I installed and opened it to witness an amazing interface, really cool and user-friendly. APUS Launcher is a launcher suitable for any Android version and literally for any Android device. APUS Launcher has a lot of themes, literally everywhere, even in the app itself, you really don’t need to go to google play store to download any theme, you can go to the launcher settings and download new themes to further customize your launcher screen. In addition to this amazing launcher, APUS Launcher installed on your Android device will automatically install a battery saver and a booster. Amazing right? This app is just 16MB in the installation size, with over 100 million downloads, which shocked me, really APUS Launcher got 100 million downloads, that’s how good the launcher is. Okay, we are here, I’ve been waiting for this launcher, the Fifth Best Android Launchers For 2019 on my list. Now, if you haven’t heard of this launcher before, you’ll probably think this launcher is for Windows phones only, but nope. Microsoft Launcher is basically a launcher for Android devices, you might just like the windows user interface, but you love the fact that getting apps is easier with Android than Windows, so, therefore, you use your Android smartphone, but want a windows user interface, now you can. Just click the download link below and download this launcher for just 31MB in the installation size, with over 10 million downloads so far. Your Microsoft launcher with your universal search bar, link your phone to your Laptop using the Microsoft launcher. Customize the icons to look like a windows phone, someone looking at your Android device, will be like, ‘wow, you got a new windows phone bro?’ and if you want to play along, you’ll be like ‘Yea bro’. Adjust your icons and have any app you want exactly where you want them. One of the launchers that I have personally used over and over again, is this particular launcher right here. Nova launcher on my list of the Best Android Launchers For 2019, is totally full of amazing features fun and user-friendly. There is literally no other launcher like this launcher. Nova launcher has a way of changing your interface and giving you the ability to fully customize the launcher. Change icons, change themes, change wallpapers, with Hd 3d graphics and animations. When you talk about Nova launcher, you talk about animations, amazing animation styles available in this app, change your animations as many times you want. Now, also makes use of the color controls feature, color your icon labels, unread badges indicator, and folders. unlimited access to customize all that you want. customize your layouts, no need of me telling you what to customize, you’ll see how it works when you download this app and do it for yourself, using widgets and other amazing features on your home screen. 50 million downloads so far. This launcher is fast, user-friendly, smart and amazingly outstanding, 2019 special release. 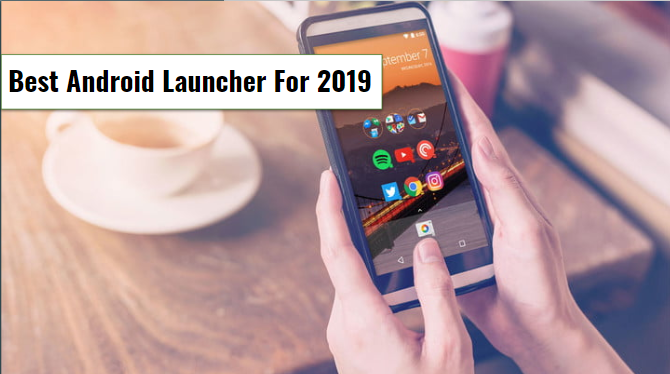 This list of the Best Android Launchers For 2019 is focused on launchers that will put a smile on your face, and also about launchers that are easy to navigate, basically use. U launcher Lite is a new 2019 launcher with all the amazing features and cool themes that it should have. change your themes from time to time and set wallpapers too. Someone like me that loves changing wallpapers basically every day, each new day, a new wallpaper. You have the capability to do so here with U launcher, there is always a new update every day, so you can never run out of wallpapers. This launcher is 9.4MB in the installation size, with over 5 million downloads so far. Google’s got you covered with their very own launcher, it’s totally amazing, available and suitable on all Android device for just 7.9MB in the installation size, with over 100 million downloads so far. customize your home screen with wallpapers, icons, and swift animations. Click your App drawer icon and your list of apps will come up and you can enjoy this app. The Quick search bar at the top of your screen, with Google as your default search engine is all you need. You can use google voice to make things easier for yourself, reach your apps and smartphone information through the google voice. You can put all your apps in a folder or switch between folders, customize away with your favorite Google Now Launcher. This launcher is my special launcher, no matter which launcher I’m using at the moment, I always got XOS Launcher on my smartphone and I occasionally switch to XOS and just enjoy the XOS experience, it never gets old. amazing categories of themes, about 10 of them waiting for you and 350 thousand wallpapers available in this launcher, and I can assure you, every day new wallpapers are added, once you refresh the wallpaper page. You can never get tired of using this launcher, you get bored of it after a long while of using it, but even after you switch to another launcher, you’ll basically always find your way back to XOS Launcher. SO for Android users out there, just 11MB of installation size of this launcher stands between you and the XOS experience. Alright, we are getting to the end, the ninth launcher on my esteemed list of the Best Android Launchers For 2019 and we are still bringing to you amazingly unique launchers that are mind-blowing and jaw-dropping. Personalization and customization is the key when it comes to launchers. Now, some feature I pretty much forgot to add in my above Best Android Launchers For 2019 previously was, the fact that you can hide or rather lock your app and home screen icons, as a way to protect your smartphone from intruders and secure your important information from getting to the wrong hands. Everything in this launcher is customizable, your docks, your folder, your icons, your widgets, even your weather, just so you know, Apex launcher has its own weather, so downloading this launcher is a full packaged deal, download one and get a lot free. Just 11MB of installation size is what you got to go through to use this amazing launcher, smart up your smartphone like never before. C Launcher, one of the softest and easiest launchers to use, coming in as the last launcher on my list of Best Android Launcher For 2019. If you haven’t heard of or used this cool launcher right here, then here is your chance, don’t let me stop you, download now for just 12MB in the installation size, with over 10 million downloads. Wow, I just realized that all the launchers on my list have from 5 million downloads and above, none below 5 million downloads, that just goes to prove that Android users all around the world, download and use launchers almost on a daily basis. With C launcher, you can use the Clocker and lock your home screen and even your Android device, you can also hide and unhide apps and icons as you wish. Access the C launcher settings to customize your smartphone further. Use the themes that are available in this launcher, as well as the wallpapers and other animations and effects. You can launch C launcher’s widget, weather, booster, and cleaner, use the search bar and every other feature that this launcher has to offer. For more information on this launcher, click the download link below and begin the C Launcher experience. The list of the Best Android Launchers For 2019 is so amazing that looking at this list, I just get confused, which launcher will I use, all the launchers are unique and amazing in their own way. The craziest thing to do is to download all the Android launchers on my list on your smartphone, that will just be crazy right? But right now, the way I’m looking at our list, you might have a hard time making a choice to, so you can use any launcher one after the other if you can until you get to the launcher that just makes your smartphone glow! A download link to each app from google play store has been created below each app, click and experience a new launcher interface. Thanks a lot for your time and patience, your very appreciated, for now, I got to say bye, till next time, see ya.